I do a lot of community relations stuff in my job, but I can tell that this latest project, my acceptance into the FBI Citizen's Academy, is going to be a horse of a totally different color. I've spent the last 4 or 5 years really engaged in the education community, so most of my community relations work has been with our education partners. Kids in the Big Brothers Big Sisters program struggle academically, and I have developed a much deeper understanding of why and how we can help through these partners. (Basically, that question boils down to data - how much we need and and how hard it is to get it, but that's another blog post for the future). Our kids struggle with law enforcement as well. I have experienced this personally with my own Little Brother, Christian, who developed a very adversarial opinion of law enforcement that has continuously been getting him into trouble recently. A former Big Brother (and FBI agent) approached me a few months ago about the FBI Citizen's Academy and asked me if I was interested in being nominated. I said yes, applied, and the next thing I knew I was being fingerprinted. Class started last night, with a session on Cybercrime. The first thing I have to say about this experience is that I had to go dark. No phones are allowed in the FBI building. They made me leave my Fitbit in the car. Oh dear. If I am going to engage in a community relations activity in my role as CEO of BBBS, generally I am going to social media the heck out of it. That's half the reason for doing it. But no. So for three hours I heard all these cool (and creepy) things, and couldn't tweet any of it! The Horror! Hence this blog post. I have to say a few words about who is in the class. There are 37 of us and I already knew only one classmate (an education partner from SAISD). That is a huge bonus because as much as I love seeing the usual suspects at every meeting I go to, I also love to meet new people with the potential to be useful to Big Brothers Big Sisters (cause everyone can be, just ask me how). The group is very diverse professionally. There are people in banking, insurance, security, entertainment, real estate, media, sports, travel, medical, faith based, marketing and a lot of former military personnel. There was even an Afghan linguist and a "Turkey Fryer" (one classmate's colorful description of a restaurateur). 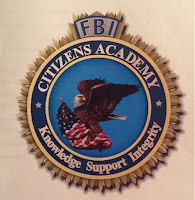 The class is less diverse in gender: I think there were 9 or 10 women, which makes sense because I imagine the FBI is male dominated and Academy candidates are recommended by current FBI, such as the Special Agent who recruited me (props to him for recruiting a female participant!). Ransom-wear: You open an email from your boss with a link to a survey she asks you to take. You click on it and it goes nowhere. You shrug. Later your whole company's system goes down. Your boss gets an email telling her to pay up and she will get all her company's data back. It's not that huge of an amount of money, so she pays because that's the lesser of two evils between the loss of productivity while she tries to get the company's data back for months and being blackmailed. You never get another raise or promotion. SWAT-ING: You love video games and you are blissfully sitting on your living room couch gaming when your front door is kicked in and men with guns swarm into your house. You're snatched off the couch and thrown to the floor, a knee thrust into the middle of your back. Everyone is yelling. You have no idea what is happening. Hopefully that is all that happens before the men, FBI agents, figure out that they have been "SWAT'ed." They broke into your home following a distress call that you were inside with a gun about to kill your wife. The caller was probably a 14 or 15 year old bored hacker who clearly could use a Big Brother. PHISHING: You are at a community fair and someone gives you a thumb drive. Unbeknownst to you, this is an evil thumb drive. When you plug it into your computer it gains control on the back end and finds all your usernames and passwords and steals money from your bank. Then, just for fun, it turns on your webcam and watches you. Scare-wear: A "virus-protection" box pops up on your computer saying you have a virus and to click the button to clean it up. You click and unleash the actual virus. Or, it's late at night and you're surfing the web in the dark and a voice comes out of your computer speaker and calls you by name. It's another bored evil creepy hacker. Muhahahaha. This class is every Thursday night and next week's topic is "Crimes Against Children." It's probably a good thing I will be social media dark for that one. Stay tuned for FBI Tales Part 2 next week. Well, I virtually live on my computer/phone so I'm sure I have been hacked. Sounds like you are going to learn a lot as part of this FBI Academy. Keep us in the loop. And as always, a very good post!